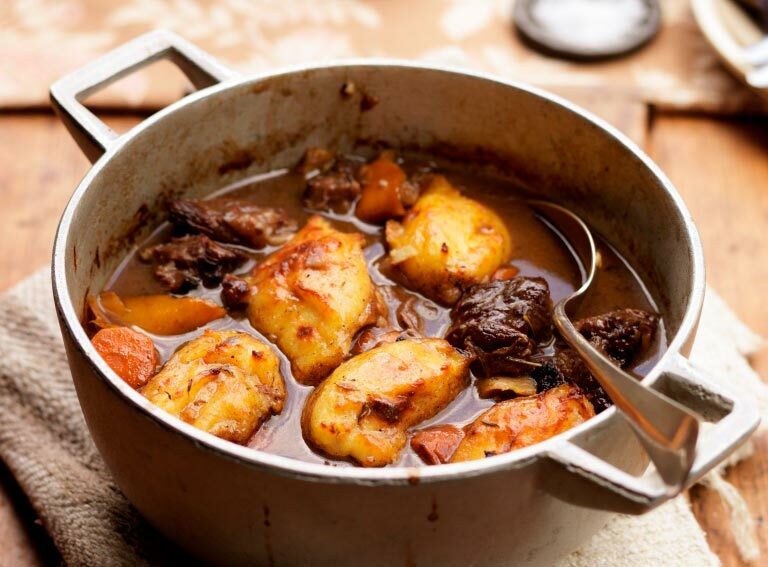 Beef and horseradish, stew and dumplings - this dish is comfort food taken to new levels of contented cosiness. Pre-heat the oven to 160°C/325°f/gas 3. Cut beef into large chunks. Season each piece of beef with salt and pepper and colour all over. Add a knob of butter and add the carrots, onions and cook until nice and brown. Stir in the flour until golden brown, add the orange juice and bring to boil. Add the red wine and the peel of 2 oranges, thyme, rosemary, bay leaf, peppercorns and sugar and bring to the boil. Reduce by 2/3 and add the stock. Bring to simmer, cover with a lid and cook in the oven for an hour at 170 degrees Celsius. Remove the lid, spoon 4-6 of the dumpling mix on top place lid back on and place back in oven for another hour. Remove the lid in the last 10 minutes of cooking. Bring milk, horseradish and butter to the boil. Stir in the semolina and cook until thick. Beat until cool then add the egg and season with salt and pepper. Scoop onto cooking beef 1hr before.